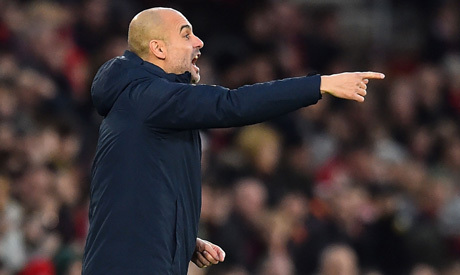 Pep Guardiola has warned his Manchester City side a failure to beat Liverpool at the Etihad Stadium on Thursday will effectively mean their title challenge is "over". Reigning champions City revived their bid to retain the Premier League trophy with a 3-1 win away to Southampton on Sunday that followed shock defeats by Crystal Palace and Leicester. Victory at St Mary's, however, still left City seven points behind leaders Liverpool and for a while it seemed Guardiola's side might drop more points on the south coast. David Silva put City ahead after 10 minutes but they then squandered several chances and gifted Pierre-Emile Hojbjerg a 37th-minute equaliser. But the uncertainty that crept into City's play was ended by a James Ward-Prowse own goal and a Sergio Aguero header just before half-time that left City 3-1 up. Saints' frustrations boiled over with a red card for Hojbjerg after a wild challenge on Fernandinho late in the game. "We knew it, that with the position of Liverpool, if we drop points then it is over, it (the title race is finished," Guardiola said. "It would be almost impossible. Of course they are going to drop points but not too many. If you want to be there as far as possible until the end we have to remember what happened last season and this as well –- apart from the last few days," the City manager added. Guardiola was adamant he had not lost confidence in his side, despite the Palace and Leicester reverses. "How can I doubt them?," he said. "Football is like this. We make 30 exceptional minutes again, especially without the ball, we create chances to go 2-0 or 3-0, we concede one goal. "Against Crystal Palace and Leicester they were happy with 1-1 and they found a second one, I always judge our intentions of the game and always our intentions are to try." The former Barcelona and Bayern Munich boss added: "We won a lot of games but unfortunately we lost two and we have a rival (Liverpool) who at the moment is the best team in Europe, or in the world. "That’s why it's a challenge for us next Thursday, to try and win and sustain this position as far as possible to arrive at the end of the season fighting for the title." City may again be without Kevin de Bruyne against Liverpool because of the influential playmaker's muscle problem, but Guardiola rejected suggestions that a defeat of Southampton had sent a message to Jurgen Klopp's Liverppol side. "We're not here to send a message," he said. "Liverpool know what they have to do, we know what we have to do next Thursday. I know the distance is big, seven points, especially because they're so solid and consistent, but we're at home. "Hopefully our people at the Etihad can help, they can support us. Not just for the game, but these players deserve it. What they have done in the last 14 or 15 months, how they defend this club, is incredible, it’s massive," Guardiola added. Southampton had hoped to contain City and to an extent it worked, as Hojbjerg robbed Oleksandr Zinchenko before equalising. But Ward-Prowse's unlucky deflection of Raheem Sterling’s shot between goalkeeper Alex McCarthy and the near post and Aguero’s unchallenged header from Zinchenko's cross effectively settled the match before the interval. "First 20 minutes we had no chance, they were very dominating," Saints manager Ralph Hasenhuttl said. "But suddenly you saw that they are not perfect. "They take a lot of risks and if we are sharp we can maybe win the ball and score and we did, a fantastic goal by Pierre. That gave us the hope that we can spring a sensation. "But two horrible mistakes before the break and we gave it away in a way that was too easy. That changed everything."